A man from Kyushu is waiting for the results of a lawsuit and is detained in Kyoto for three years. Concerned about his wife, he sends his maidservant Yūgiri to let her know he will not be returning until the end of the year. The news causes his wife to feel melancholy. 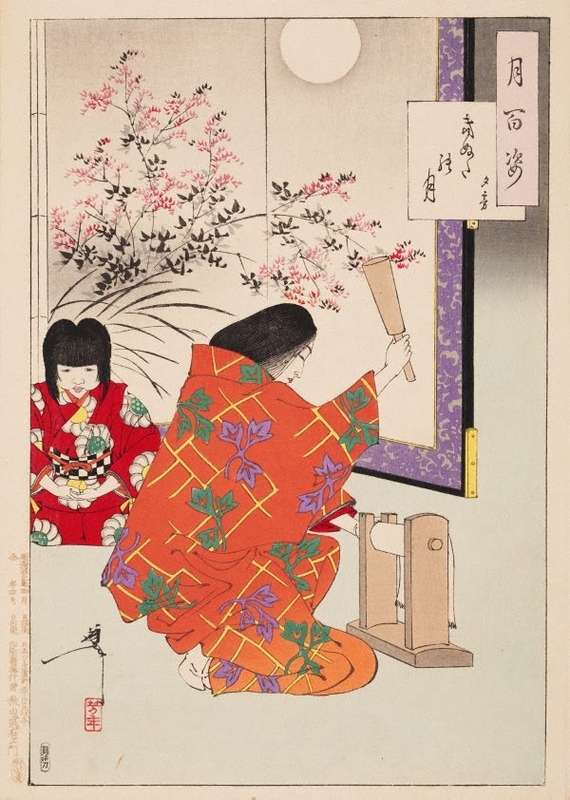 To soothe her, Yūgiri organises implements her mistress can use to pound cloth, a task traditionally done to soften textiles. This is an allusion to a Chinese Tang dynasty poem where the beating of cloth by a wife can be heard by a husband who is far from home. When the wife receives news that her husband will be delayed, she goes mad. He eventually returns to discover she is dead. The moon is shown on the folding screen; a flowering bush clover represents autumn.